La Envia Golf Club 18 hole par 70 course stretches over more than 5,700 metres of undulating terrain, with numerous bunkers, water features and carefully positioned greens to present the golfer with an interesting test of their skill and ability. Reservar Green fee online en La Envia Golf. If you are looking for Local Accommodation click into the local info links. Vincci Selección Envia Almería Wellness&Golf 5-star hotel. Situated on Envia Golf Course, 15 minutes’ drive from Almeria, this stylish 5-star hotel offers swimming pools, a wellness centre and wonderful views. The air-conditioned rooms have extra-large baths and a balcony or large window. All of the modern, spacious rooms at Vincci Selección Envia Almería Wellness&Golf have free internet access and satellite TV. Most have views of the surrounding hills. 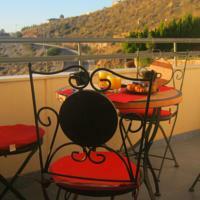 Apartment Casas Nuestras Envia Golf Vicar. Located 14 km from Almería, Casas Nuestras Envia Golf Vicar offers accommodation in Vícar. The property boasts views of the sea is 8 km from Roquetas de Mar. Free WiFi is provided throughout the property. La Envia Golf & Country Club runs the length of a valley with the surrounding mountains shielding the course from any wind – creating superb golfing conditions. Palm trees, Mimosa trees and many indigenous plants, flowers and shrubs run the length of the fairways and beyond, giving the impression of a vibrant oasis in the heart of a spectacular desert. The 18 hole par 70 course stretches over more than 5,700 metres of undulating terrain, with numerous bunkers, water features and carefully positioned greens to present the golfer with an interesting test of their skill and ability Furthermore, La Envia Golf is noted for the care of its interesting and challenging greens, many of which are raised, designed to bring a mixture of fun and difficulty to your round. The front nine can be described as relatively flat, longish holes, especially the 2nd and the 5th which will help prepare you for the back nine – though they are shorter in distance they require a more thoughtful approach to each hole. Holes 12, 13 and 14 – known as La Envia´s “Amen Corner” – do allow for the possibility of a birdie or two, though they can just as easily ruin your card! Costa Del Sol Michelin ZOOM map 124 (Michelin Zoom Maps). MICHELIN zoom map Costa del Sol is the ideal travel companion to fully explore this popular Spanish destination thanks to its easy-to-use format and its scale of 1/200,000. In addition to Michelin’s clear and accurate mapping, MICHELIN Zoom map highlights all the leisure activities available, such as golf clubs and tourist trains. MICHELIN Zoom Maps also include star-rated scenic routes, tourist sights & attractions, as well as camping sites and hotels selected in the famous MICHELIN guides. Make the most of your stay with MICHELIN Zoom Maps. SPAIN INFO. La Envia Golf Urb Marina, San Fulgencio, 03177, Alicante, Spain.